For this year’s summer show, Boers-Li Gallery asks some of their gallery artists to invite one artist friend to show with them side by side. By means of invitation, “Among friends” not only will unveil the social dimensionof artistic practice, they hope the congregation of their visual endeavors will also further illuminate the inspirations, visual sources, and dialogues among their artistic practices. Friendship is the mutual relationship between two individuals, built on affection, respect, appreciation, like-mindedness and etc. While artistic practice is often construed as a solitary undertaking in one’s art studio, by the law of attraction, like-minded artists have conferred throughout the history of art worldwide. In some cases, their coming together changed the course of art history, either by setting new artistic trends, style, genre, or heralding new notions of what art is, for instance, Matisse & Picasso, de Kooning & Pollock, as well as all the friendships we have witnessed, long-lasting orephemeral, since the emergence of Chinese contemporary art. In the case of this exhibition, the bond that holds these friendships together varies. Some of these artist pairs came together through a common artistic form they are exploring, in particular, abstraction. For the older generation working in this direction, such as Zhang Wei & Wang Luyan, Ma Kelu & Feng Lianghong, their early experimentation with abstraction in the early 80s forged their friendship and continue to ground their mutual support and respect for each other’s practice, in spite of the disparate artistic languages adopted in one’s subsequent artistic career; whereas for the younger generation, Wang Haiyang and Xu Hongming, who work between the figurative and the abstract continue to mediate these two forms; others such as Ou Jin and Zhang Ji thrive on sharing a common interests in exploring texture on canvas that temper with our optical faculties; whereas,the art practices of Wang Wei & Li Jinghu share the common “archaeological” impetus, both fascinated with visual phenomena in their immediate environment, are propelled to translate their observations into diachronic presentations; for Gong Jian and Yang Xinguang, both adopt natural material/subject matter as leverage to scrutinize existing aesthetics, thereby tapping into deeper social and political issues that lie beneath visual surface; and lastly, Xue Feng’s invitation extended to Zhang Liaoyuan reflects his own state of artistic practice in recent years, where Zhang shifts from conceptual and notional driven artworks to returning to the fundamentals of one’s artistic medium. For an artist’s practice, solitude and social interaction play equally critical roles, while the former may allow one to focus introspectively, the latter offers indispensible inspirations and feedbacks between one and another. 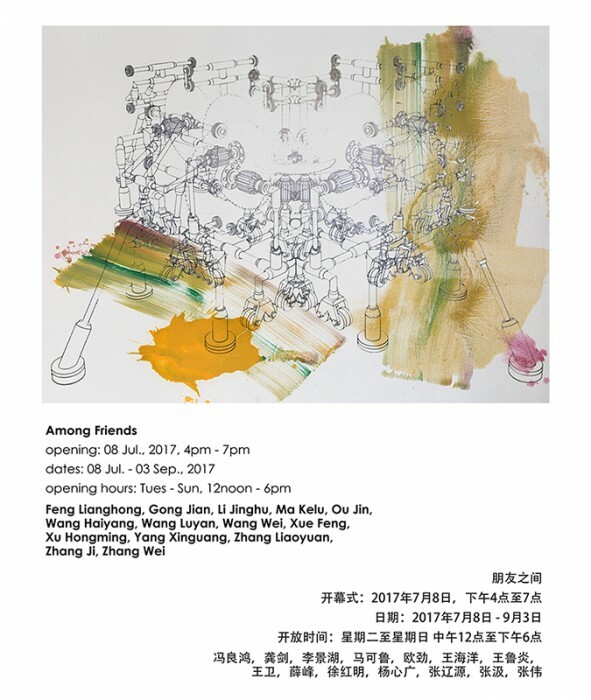 With the presentation of these artist-pairs, we are revealing as much the supportive friendship among them, as their works of art that shed light on the ongoing artistic discourses in the Chinese contemporary art practices afield. Courtesy of the artists and Boers-Li Gallery, for further information please visit www.boersligallery.com.